Copy with confidence with the IT36C6, with 36 cpm color output that enables you to keep up with the pace of business. Print with ease with the standard print controller that enables PCL-6 and PostScript-3 emulation for PC and MAC. 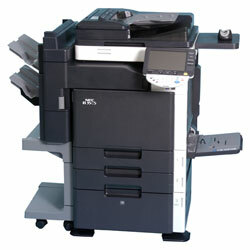 Network integration allows everyone in your office to connect to the IT36C6 and print high quality color and B&W documents. Ease of use, security and management are all integrated for your business. The large tilting color touch panel with bright LED colors, and easy to load paper drawers provide Section 508 Compliance.